What a difference two weeks makes. 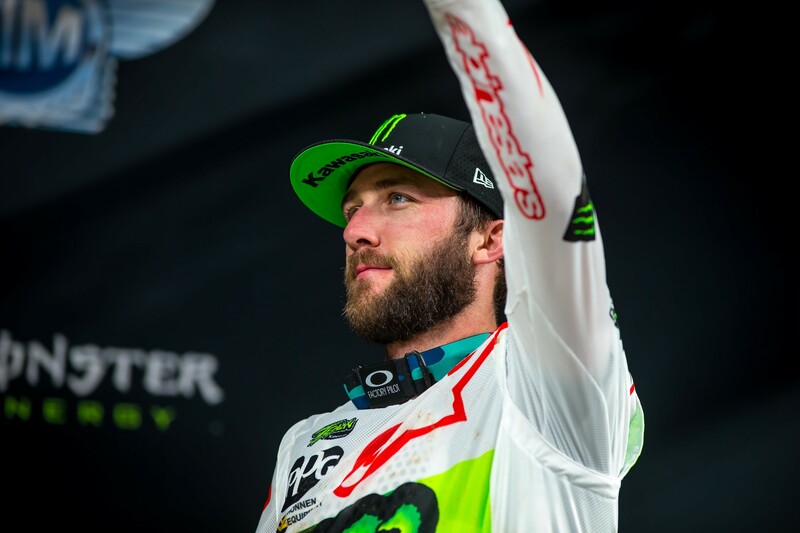 During a mid-season slump, we heard (and made up) so many theories as to what was wrong with Eli Tomac that just about anything sounded believable. For a rider with his speed to be struggling so badly—while apparently not injured—it just didn’t make any sense. Maybe Eli was burned out? Done? Over it? Needed a change? Something? Anything? Who would have thought that he was on the verge of some bike changes, and then he would win two races in a row and look happier than we’ve seen him in quite some time. The difference between Tomac then and Tomac now—wow. Because Denver marked his first-ever supercross in his home state, he was in an exceptionally good mood all weekend. We talked to him about it after the post-race press conference. Racer X: Was this the most fun you’ve ever had at a race? At least up there? You seemed like you were in a great mood all weekend. 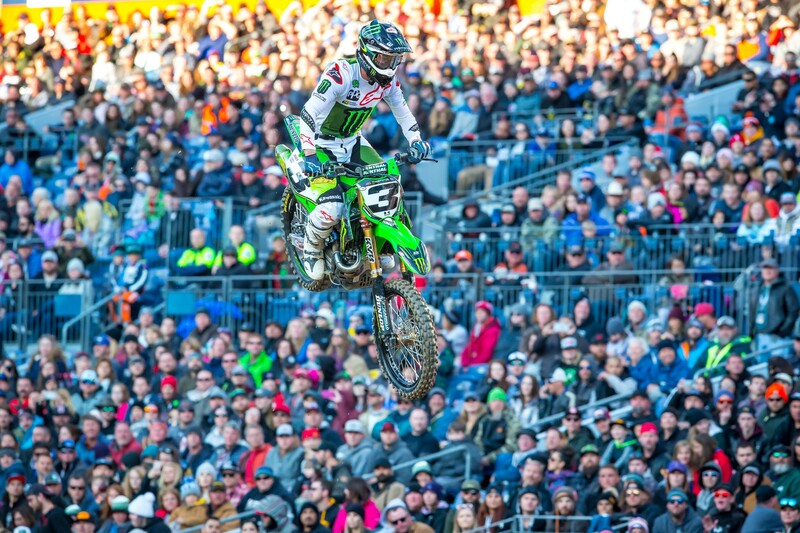 Eli Tomac: Yeah. I mean, that just got me excited! Just the home race thing? Just that the crowd was crazy! That did it. Yeah, the home race was sweet. Yeah, it was cool, I knew our bike would feel slower and the other guys would be floundering around with that, and it would be cold and that would probably freak people out. [Laughs] I was pumped on that! Then the night just went right. We were fast all day, fast in the last practice. It was good. I’m assuming you’ve ridden in some snow flurries before? We rode in snow flurries on Wednesday! Yeah, but I actually didn’t get all the riding I wanted in on Wednesday because the weather cut it short. But it was good to get some time in in those conditions, yeah. So why was Wednesday the last day you rode? Were you getting stretched with PR duties this week? Well yeah, and we expected to ride here on press day on Friday but that didn’t happen. [Note: Friday’s press day riding was cancelled.] We did a lot more media than the average week. Our biggest commitment was visiting numerous local TV stations, trying to get the word out. I think it helped, we had a good crowd tonight, I think the two lower decks were full, so that was sweet. You had some local friends and family here, too? Oh yeah, we had well over 50 people we specifically had to get tickets for, from down on our side of the state. The crowd was going nuts. Even when you pulled a lead you were riding by yourself, they were going nuts! How does that affect you? I don’t care what you say, you’re thinking about it when it’s that loud! It was crazy loud! Like, holy crap. Don’t you wear ear plugs? And you could hear it anyway. Did it even drown your bike out at one point? When we went over the triple, either when I was close to the lead or had just gotten the lead, the noise was…. up there. It was unbelievable. The start. It didn’t look like you had a good start going into turn one, but you played the first turn perfectly and that helped you get up there. Were you worried? I played it good, I was a little worried, yeah. There was someone that came from the inside, like literally out of nowhere, and that shuffled me back a little bit. I didn’t want to be second or third in line in the first turn. But I was able to sneak around, about halfway to the exit of the corner there. That set me up. You were one of the few to jump that triple in, and then jump onto the tabletop, in the big rhythm. And then you kept doing it late in the race. Did you keep doing it because crowd was going crazy for you in that section, or was it actually pretty easy to do that? It wasn’t easy. Gosh, at the start of the race, you could use the middle rut to do it, and then later on I was able to come down a rut and still do it. So it wasn’t easy, but that was my spot to make my time. We timed it in practice and it was a half second, maybe three tenths. That was a spot to make some ground. Eighteen points down with two to go. Do you think more about the title now than a few weeks ago when you were further back? I’m just doing what I’m doing. As long as I’m within 26 points, we’re doing our work. Man, you must be feeling so much better than two or three weeks ago. Oh yeah, we’re riding good, we’ve improved. I don’t know what to say right now. We’re rolling. Are you going to change more things? No, we’ve won the last two, we’re in a good spot. The proof is, last week you said the problem had been that the window was small, it (the bike) wasn’t working in all conditions. But today, we had snow in one practice, it was getting wet, then later it was dry. So, that would make it seem like the bike worked well in different conditions. Did the track change that much? You know, the track all day had a base. It didn’t change that much. But it was good to just go out all day and win, win, win. So the track really didn’t change that much? Not really. It never got crazy slick with the snow, just a little. Really, all day, it was just hard pack. How did it not get worse? That was a good amount of snow! I know! Well, it was just so dry under there. You’d kick the dirt during track walk and it was really dry under there. It actually needed it. So is this your happiest race ever? I mean, that’s the stuff you remember. You don’t remember every win, but this is one you’ll never forget. That is cool, that is different.